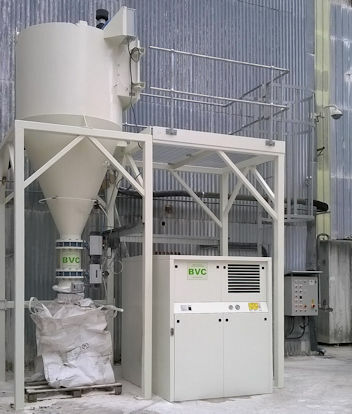 MARKET LEADERS IN CVC SYSTEMS – BVC are market leaders in Central Vacuum Cleaning Systems for industry and industrial applications, with installations across the whole industry spectrum; pharmaceutical and food production to mineral processing and power generation. Clients worldwide have benefited from the solutions provided by Quirepace. As Specialists in the field of ATEX compliant vacuum systems and cleaning machines, BVC can design ATEX compliant Central Vacuum Cleaning Systems, also systems to handle toxic and hazardous products and where required, safe change technology. A turnkey service from conceptual design through to commissioning and handover is available, with service agreements, after warranty period, available from our after sales team. A Central Vacuum Cleaning System is an ‘online’ cleaning system where the operator inserts the hose into a connection point, to carry out cleaning operations. The extracted materials are pneumatically conveyed to a separator for final disposal. Strategically located hose connection points throughout a facility are interconnected with graduated pipework systems, terminating in a vacuum plant. Fixed installation vacuum cleaning systems provide a means of both cleaning and recovering product for either disposal or recycling. Discharge can be into bags, sacks, trailers, skips and other containers. Whatever the industry, if a Central Vacuum Cleaning System is required, there is a BVC solution. Call us now and find out more.